Grumpity and Alexa Linden host the Web User Group meetings on alternate Fridays at Alexa’s barn. The majority of these notes are taken from the Web User Group meeting held on Friday, December 8th, 2017. These meetings are generally held on alternate Fridays, and chaired by Alexa and Grumpity Linden at Alexa’s barn. The focus is the Lab’s web properties, which include the Second Life website (including the blogs, Destination Guide, Maps, Search, the Knowledge base, etc. ), Place Pages, Landing Pages (and join flow for sign-ups), the Marketplace, and so on and the Lab’s own website at lindenlab.com. Specific bugs within any web property – be it Marketplace, forums, Place Pages or anything else), or any specific feature request for a web property should be made via the Second Life JIRA. Alex Linden provides routine updates on the Lab’s SL-facing web properties as and when appropriate, which can be found in the Second Life Web thread. Note that the SL forums are not covered by the Web User Group, as the management of functionality of the forums falls under the remit of the Support Team. They also have to sign-in to different properties when opening them in new tabs, even if already signed-in elsewhere. Having very restrictive cookie settings could cause problems with SSO. There may be a specific order of log-in that is required for it to work, which the Lab will check. Otherwise those experiencing such problems are asked to write-up a details JIRA on the problems they are experiencing, and the domains where SSO appears to be failing. Often at user-group meetings questions are asked around matters of governance or which may be related to legal / financial issues (e.g. fraud or alleged cases of fraud). All of these matters are overseen by teams outside of the technical personnel who attend the in-world meetings, and so – while it may be frustrating for those raising the questions – cannot comment on or address such issues. Blank folder names in listings: see BUG-9984 – this is still occurring, and the JIRA has been re-opened for comment, with a request that specific recent instances of the problem are reported (you may need to send an email to LetMeIn@lindenlab.com & request access to comment. Variants in listings: this is a long-standing request – to allow things like colour variants of an item in a single Marketplace listing, rather than having to list the variants individually. This is something the Lab wants to address, although it is not on the short-term list of work they will be tackling, nor is it necessarily an easy thing to implement, but it is climbing slowing up the list. Marketplace Demos: demos are a pain point for some users of the MP, in that they cannot be easily filtered out of searches, even when using boolean parameters. various ideas have been put forward over the years for better handling of searches / excluding demo items. However, most are difficult to implement successfully, simply because of the way the system can be gamed (e.g., boolean exclusion of “demo” can be currently gamed by people listing items as “d_emo” or similar). The Lab is aware of the pain points with demos and free item listings, but again, this are things which have yet to rise to the top of the list of improvements they would like to make to the Marketplace. Feature requests – raised via the Second Life JIRA – are the best way of bringing ideas to the Lab’s attention. These are reviewed an assessed (triaged) on a weekly basis. When raising a feature request, remember to state a clear user case: what the issue being addressed is, why it matters, how your idea improves things, an indication (the more detailed the batter) of how the idea can be implemented, and so on. If you’re proposing a UI improvement, then consider including mock-up images of whatever you are proposing; if it is possible to illustrate the idea clearly some other way, do that, and provide an explanation. Try to be as clear and direct as possible. 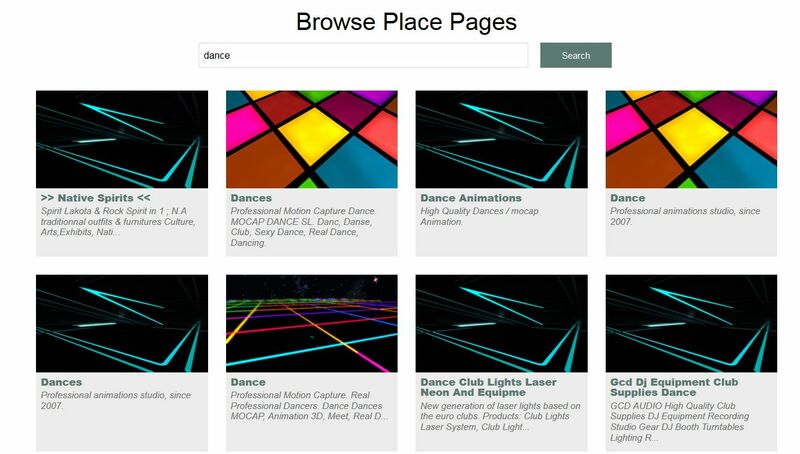 The Lab continues to tweak and improve Second Life Place Pages, the most recent addition being to the seach option, which now titles thumbnail images and descriptions of places matching the search criteria. The wiki search is currently broken: this is a known issue at the Lab and is being actively investigated. Inventory & load times: The Lab hopes to do further work on inventory, looking to improve things like load times and overall inventory robustness. This work will initially focus on fixing some bugs and deprecating various old UDP messaging, mostly likely sooner in the year than later, before moving on to hopefully making it more performant. Aditi inventory syncing: there is still an issue with synchronising Aditi (the beta grid) inventories with main grid inventories. The latest issues occurred just before Christmas and are still being investigated. Re-activating old accounts: if yo have a Basic account you have not used in a number of years and wish to activate it, it is possible that its associated inventory has been place in what the Lab call “cold storage”, and could subsequently exhibit continued slow response times. If the account is to be regularly use, a request can be made to support to have the associated inventory for the account moved – although this must be done at a time when you are not using the account. Keeping abreast of web property updates: Alexa Linden routinely posts updates on various SL web properties on the forums, where they can be seen and commented on. The Wolfpack RC viewer – to version 5.0.10.330131. The Render project viewer – to version 5.1.0.511604. Current Release version 5.0.9.329906, dated November 17, promoted November 29th – formerly the “Martini” Maintenance RC. Alex Ivy 64-bit viewer, version 5.1.0.511248, December 11.